We came back after a late-in-the-day walk to find this rugged tomato, just picked from the garden, deposited on our table by our farmer landlord, Silvia, who often brings us whatever is on the vine; squash blossoms, string beans, zucchini, eggplant, new potatoes, onions, figs, grapes, plums, and so on, but this creature sat there looking ugly/beautiful, and that always gets to me. Ugly/beautiful is one of those qualities that the world throws our way in unexpected moments, and when I see it I am reminded of how great the variety of what we call beauty really is. It suggests a reconsideration of what we think we know about beauty, and our own values. It’s not that this tomato is any kind of paragon of beauty, but simply that it made me pause for just a moment to look at it, and once I paused I saw the light making lines like the tomato’s lines, and then I felt the sweet sentiment of Silvia’s generosity, add to that the lateness of the hour and its color, and what came over me was the plain song of the evening and the goodness of life. All from stopping to look at an imperfect tomato. 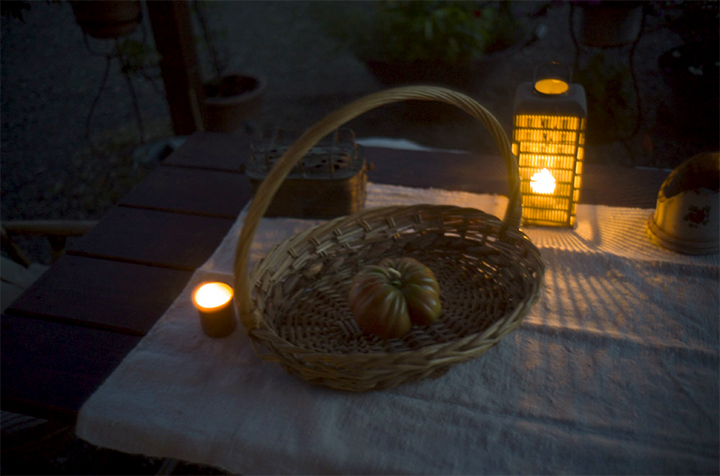 This entry was posted in Evening light, Still Life, Tomato, Ugly Beautiful and tagged Dusk, lights, Still Life on August 19, 2015 by joelmeyerowitz2014.